Travis Grillo will try to pickle just about anything as long as it’s fresh, sweet and capable of providing the crisp crunch that has become the distinctive sound of Grillo’s Pickles. From its new storefront in Cambridge, the local pickle company pushes culinary boundaries with the likes of pickled carrots, apples, green beans, asparagus, grapes, okra, and watermelon rinds. But even with new varieties coming out each season, their loyal customers continue to vociferously demand the original cucumber spears—a family recipe that’s stood the test of time. Grillo’s Pickles has defied all expectations for an independent pickle producer. Its products are on the shelves of dozens of independent shops, Whole Foods supermarkets, and Stop and Shops across the northeast. With the company already producing over 20,000 jars per month, Grillo’s Pickles announced publically on Tuesday that it will double its current distribution in the coming year as it expands into 50 additional Whole Foods supermarkets. The company’s founders dream about replacing Vlasic’s glass jars with Grillo’s Pickles’ plastic containers on supermarket shelves across the country, but they’re present goal is simply to get people to try their product and enjoy eating pickles once again. “I think that’s really what sets us apart from a lot of other pickle companies.” Eddie Andre, Grillo’s one-man marketing team, said, “We make pickles fun. We have a great product, but people enjoy hearing our story.” Grillo grew up watching his father make pickles every summer with cucumbers and herbs from their backyard. In 2008, an unemployed Grillo decided to he’d start to sell those pickles. He shoved dozens of cucumbers down a PVC pipe lined with razor blades and mastered the secret family recipe. The “quick-pick” style recipe doesn’t use preservatives or boil anything. The recipe calls for spring water vinegar as the base of the brine and only the freshest of ingredients pass the test. The result is a sweet and salty pickle with more snap than all three Rice Krispie’s mascots combined. 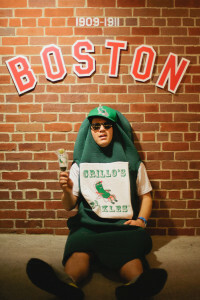 Grillos’ mascot, a chilled-out anthropomorphized pickle wearing two right-footed sandals, a pair of shades, and a baseball cap lounges in a lawn chair, reflecting the playful attitude of the young company. Grillo sold the first batches of pickles out of the back of his 1985 Cutlass. “People liked them,” Andre said, “it was just sketchy because we were selling pickles out of the back of a car.” Bolstered by the success of selling pickles on the street, Travis Grillo and his cousin, Eric Grillo, obtained permits to sell pickles on the Boston Common. Outfitted with a homemade pickle cart and a giant green pickle-suit, the pair drew attention from tourists and locals alike. “We have people who say they hate pickles, and then they try them, and they absolutely love them,” Andre said. The pickle-cart’s first customer was one such grumpy old man who laughed at Grillo, age 27 at the time, and said he’d never make a profit. After he tasted a pickle, however, he changed his mind. According to the cartoon that plays on a loop in the Cambridge storefront, the old man returned every day that summer to buy pickles—two for one dollar as the green sign on the pickle cart advertises. Within six months, a representative from the Fresh Pond Whole Foods approached Grillo and offered to sell his pickles. The company now contracts out part of its production to a local factory, but the pickle-cart and the community-spirit still remains an integral part of their philosophy. with him to hand out. Andre says their customers range from college-student foodies “who just think Grillos are badass” to blue-collar workers who leave their trucks running while they hop into the store. Families bring their kids for a healthy treat and Andre always has a fork ready for the mailman who doesn’t like to reach into the jar. Grillo’s rents their storefront from Clover Food Labs who fries their pickles and sells them from their food truck. Taza chocolate is contemplating pickled chocolate and Eric Grillo is currently attempting pickled ice cream. In many ways Grillo’s Pickles represents adventure and experimentation. But at its core, Grillo’s Pickles is a century-old family recipe and a commitment to make good food for family and friends.